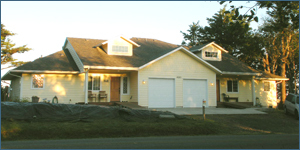 Welcome to Seashore Dreams Vacation Homes, located on the North Washington Coast. We offer three different homes to choose from, each with their own unique feel. All are located in the tiny towns of Pacific Beach and Moclips. If you aren't sure which home is best for your vacation, please email me through the contact form on our website. The duplex townhomes with the ocean views are called: "Coastal Breeze Cottage" and "Sea Mist House". Virtual Tour Both Units - New!! Sea Mist House and Coastal Breeze Cottage are situated high on the bluff overlooking Sunset Beach in Moclips. The colorful sky scape is never the same as you take in the dramatic ocean views from just about any room. Our "Coastal Breeze Cottage" is perfect for the ladies get away or celebrating grandma's 80th birthday. This cheerful beach themed home sleeps up to 6 guests and allows up to 2 small dogs. The third bedroom up the spiral staircase has a daybed and rollout twin. Those who stay here, enjoy a light and bright home with some modern whimsy and original art work decorating the walls. The owners share their fondness of Moclips historic past with framed photographs in both homes. Sea Mist House is also dog friendly and uniquely features a "poetry wall." Several guests have been inspired to write poems which the owners have posted in the dining area. This home has all the same amenities of Coastal Breeze but is done in a Whale and Sea Captain theme with misty sage walls and natural wood work. Our guests have commented that it has the most relaxing feel. Sea Mist House can sleep up to 6 guests and 1 large dog. The twin homes are situated in a unique area off Highway 109, just one block North of Ocean Crest Restaurant - one of the longstanding resort restuarants recently refurbished. The carefully planned duplex homes were designed for one level living, universal design which includes a wide front door, ramp entry to porch, lever door handles, lower light switches, wheel chair accessible shower and support bars. Seashore Dreams Vacation Rentals in Moclips on the Washington Coast, north of Ocean Shores, Seabrook, And Pacific Beach, are available for daily or weekly rental to you, your friends, and your family. If rest, relaxation, and comfort are what you need, then Seashore Dreams is the perfect get-away. Whether you just want to curl up and read a good book by the fire or play golf in Ocean Shores or travel one of many short day trips to Forks, Olympic National Park Rainforest, Lake Quinault and more - there is something for everyone. For you photographers don't forget the camera! For information on Sea Mist House and Coastal Breeze Cottage Duplex availability, check our online Calendar first, then contact us.